This hanging magazine rack provides a large amount of storage space to keep literature looking neat and organized. 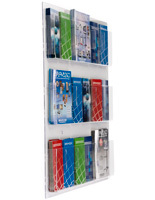 The all-acrylic design makes this literature holder suitable for any type of office or commercial environment. 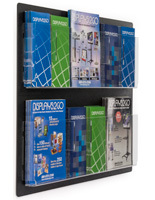 This brochure display, hanging magazine rack has 12 pockets that hold 8.5" wide material. 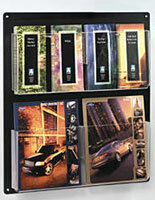 These pockets can also be divided to create up to 24 slots to hold standard brochure size literature, (4" wide). 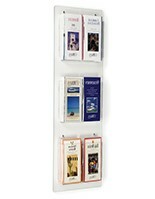 This hanging magazine rack is the flyer organizer preferred by hotels, car dealerships and travel agents. Many businesses mount this pamphlet dispenser in a lobby or waiting area to offer patrons free reading material to peruse. This hanging magazine rack is also typically seen in medical offices. This versatile acrylic literature holder is easy to maintain, and requires no tools to change the pocket size. Each hanging magazine rack is shipped fully assembled. Users will only have to insert the pocket dividers if needed prior to installation. 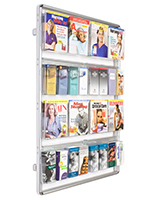 The mounted brochure fixture, hanging magazine rack includes all of the necessary hardware to mount properly. Due to the large size of this pamphlet organizer; two people are recommended to hang this unit. 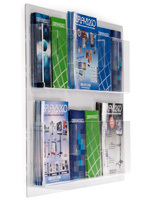 This hanging magazine rack features clear acrylic panels that allow for an unobstructed view of the entire literature on display. Each row is fully visible, with no overlapping. Buy this hanging magazine rack for your office or business reception area today. Displays Cleaned up our front office! 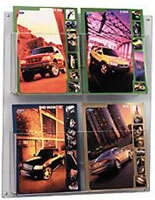 We ordered 2 of the acryllic brochure wall organizers 24 spot. This has organized and brightened our front office where we keep program curriculum and informational brochures and makes us smile when we walk in each morning. No more sifting through piles of material to find what we need. Thank you so much for sharing your experience with us, Susan! 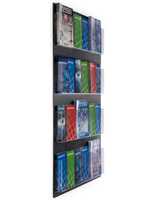 We're so happy to hear that this literature rack has made your office a much cleaner and brighter environment. product looks nice although it is not as strong as expected. the back panel is a little to thin for such a heavyweight product but should hold up once it is placed on the wall. the smaller ones I ordered were more sturdy. I also think to convert a sleeve from 8'' to 4''would require getting to the back of the panel each time which is a real hassle. We're sorry to hear that the product wasn't entirely up to snuff, Chaim! We appreciate your feedback and will be passing this along to our product team for review. In the meantime, we'd like to make sure there's nothing else we can do to assist or if there is perhaps a product that we may be able to exchange that may work better for you. A customer care specialist will be following up to see how we can help. Amazing Piece. BIG which is great very easy to see the papers.Clear so blends right into the wall. Bought because it could fit letter size and brochures and able to easily interchangeable anytime. Already assembled so Easy to install. Looks great! Shipping was quick and customer chat was very helpful. Would definitely buy from this company again! Great Product! We're so happy that you love your product and that you had such a nice shopping experience with us, Jenn! We're glad to have you as a customer. Thank you for the great review and... we agree, your literature holder looks awesome! The piece is big -- be sure to measure your space to ensure you want something this large. The plastic is good quality and all the hardware was present. I ordered it because of the adjustable pockets. We have a mixture of trifold brochures and letter-size newsletters and wanted a unit that would hold both. Very happy with selection. Thanks for the great review, Evanne!